You are here: Home / Home Staging / What does it take to professionally stage a vacant home and is it worth the investment? What does it take to professionally stage a vacant home and is it worth the investment? Professionals make it look easy. What does it really take from first assessment to creative design through actual labor needed to stage a vacant home to achieve expert results from cold empty rooms to beautiful rooms photo-shoot worthy of a magazine spread. Consider on average, it may take anywhere from 20-60 hours, depending how many rooms and how the large the rooms are, for professional stagers along with their assistants, and movers from start to finish to stage and de-stage 2000 – 4000 sq. ft homes. The following is what happens behind the scenes before, during and after for that fabulous staging to take place. Assessment of home to determine what is needed to stage the home or rooms desired. A Design plan is created for the rooms to be staged. A Proposal is drafted based upon the assessment and design plan for the home and sent to the homeowner for approval. Note that depending upon the size of the company and operation: the smaller furnishings, art and accessories may be stored and packed separately from the warehoused furniture. Either way those items still need to be picked, packed and readied to transport. Smaller Furnishings, Wall Art & Accessories if not stored at the warehouse will often be loaded in smaller vehicle(s), delivered, and packing supplies returned to storage with Assistant. Small Furnishings, Wall Art & Accessories: De-stage, Pack Load, Transport Inventory back to Storage with Lead Stager and Assistant. Furniture: Truck & 2 Movers travel to staged home, load, transport, unload & restock inventory into warehouse. Just as in any industry the seasoned professionals make the job look like anyone can do it, but don’t be fooled, there is a lot of work that goes into staging a vacant home, from the creative design aspect through the hard labor required to transform the home. Then the home must be dismantled and returned to its original state prior to settlement, as well as all of the furnishings must be returned back into the company inventory. This is not a job for the faint of heart or as glamorous as being dressed for the red carpet while placing a few pillows and candles in a home! After all the work that is required to professionally stage a home, Is it a worthwhile investment to hire a professional staging company to stage your home? Only if you value the time on the market it takes to sell your home and the money you will save in carrying costs while your home stays on the market. 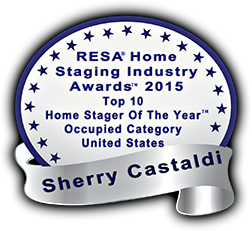 RESA, The Real Estate Staging Association reports that homes that were staged first before going on the market spent 90% less time on the market than un-staged homes and averaged 23 days on the market compared to un-staged homes that on average spent 184 days on the market. And only if are looking for real ROI, return on investment, on one of your greatest assets; your home! On average an 8-10% return on the sale price if investing 1-3% of the list price of your home. Homes professionally staged sell in about 1/3 of the time of an un-staged home and as high as 18% more depending upon the price of the home. Noting that even at an average of 7% return on the sale price still warrants a nationwide average of 2% investment for home staging. But like any other worthwhile investment, you need to invest to receive a return on investment. Savvy home sellers know the value of home staging and wouldn’t think of going on the market without having their home professionally staged. Why would anyone throw money away by not staging?